How big (tall) is a Palletcap? 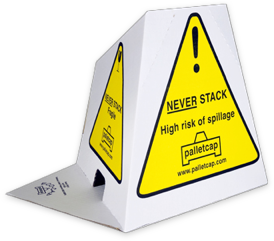 A Palletcap stands 32 cm tall. This can be reduced to 20 cm by pressing inwards from the top of the front face of the Palletcap with one hand, while holding on a flat surface in the other. What shape is a Palletcap? The three base measurements are all equal at 35 cm. The front face of a Palletcap is a large trapezium and the other two side are identical irregular quadrilaterals because the rear joining edge is shorter. The base is made up of two similar sized (although not identical) tabs or flaps which are around 16cm at the deepest point and run along the full length of each side of the base (35cm). What does a Palletcap weigh? As Palletcaps are constructed of corrugated cardboard, their individual weight is negligible. In fact, a box of 125 Palletcaps, inclusive of the carton, weighs only around 5kgs. Please note that for parcel carriage purposes (UK and International) each box is likely to be volumetrically cubed. This means that although the real weight of the box is around 5kgs, you will actually be charged based on the box volume. This is likely to be between 20-30 kgs, depending on the carrier. How many Palletcaps are in a box? There are 125 Palletcaps in each box. What size is a box of Palletcaps? How many Palletcaps fit on a standard pallet? This means that on a “quarter pallet” we can always fit 3 boxes, and sometimes 4. On a “half pallet” we can always fit 6 boxes, and sometimes 8. For Bespoke and Eco-caps we can safely stack 2000-2500 on a pallet base. Eco-caps are pre-packed in 2000 lots for this reason. For bespoke orders we divide the number of Palletcaps ordered to safely fit on the least amount of pallets, in order to keep your carriage costs as low as possible. 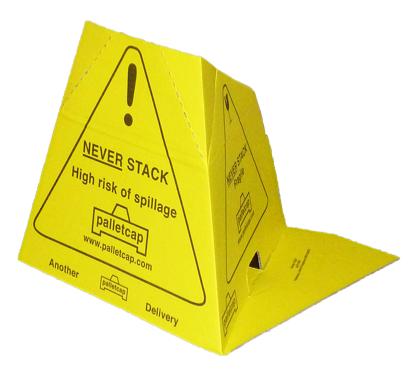 What happens if a Palletcap gets wet? Palletcaps are not waterproof. The litho print process and type of finish on our cardboard does make them hardy to a small degree of weathering, in order to stand the test of loading and unloading in wet conditions. Palletcaps should not be left outside in the elements during damp or wet conditions for any period of time. If your supply of Palletcaps do get wet, spread them in a warm area completely flat to dry. In most cases the Palletcap will recover sufficiently to be used or reused. 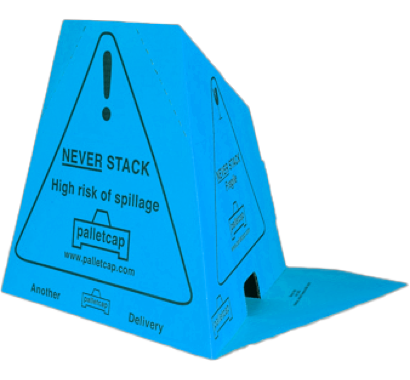 Do not store Palletcaps in damp conditions. What’s the difference between a Palletcap and an Eco Cap? The only difference between a Palletcap and an Eco Cap is the colour of the background. We have opted for a luminous white background for Eco Caps rather than the high vis yellow. This allows us to save on ink costs and offer our Eco Caps at an even better price. How many Eco Caps come on a pallet? We sell the Eco Caps as pallets of 2000. However, the Eco Caps are packed on weight. To ensure that there are never less than 2000 on the pallet we have set our packing weight to the highest end of the weight bracket. This means that you may get a few more but never any less. Is there a cheaper price for bulk orders? Yes – we offer a reduced price for both multi-box orders and multi pallet order. This allows you to get up to 58% off our 1 box price.